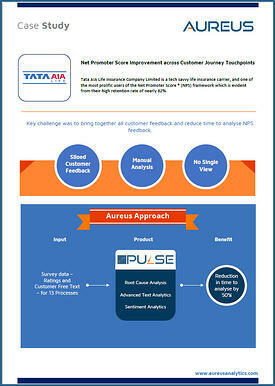 PULSE helped TATA AIA consolidate and analyze customer feedback from multiple channels and develop corrective close looping actions. Although TATA AIA did an exhaustive job collecting feedback, the data was stored in various systems and difficult to analyze. The process to review and analyze all the data proved to be very cumbersome and time consuming, which led to incomplete results. Fill out the form to see how Aureus Analytics helped this major insurer consolidate and analyze their customer feedback.